Today in Masonic History William Ralph "Dixie" Dean is born in 1907. 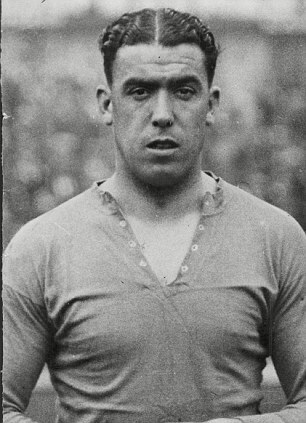 William Ralph "Dixie" Dean was a English football player. Dean was born on January 22nd, 1907 in Birkenhead, Cheshire, England. His youth coincided with World War I, from the ages of 7 to 11 he would deliver milk from a local farm at 4:30 in the morning. He would travel to family homes and make sure that they got their proper ration for the day. He would then go to the Laird Street School. Later in life he would claim that he received no education and that the only thing he would learn was football. At the age of 11 he attended the borstal school in Birkenhead. The borstal schools were youth detention centers, and although Dean had committed no crime, he told his classmates that he had been caught stealing. He attended the school for it's access to it's football facilities. At the age of 14, Dean left school to being working for Wirral Railway. This continued a family tradition starting with his grandfather of working in the rail industry. His grandfather drove the Royal Train under George V. He worked the night shift as an apprentice due to the fact his fellow apprentices did not like the large number of rats in the rail yard at night. Dean saw this as an opportunity to practice his football moves and would kick the trespassing rats against the walls. It is believed that his nickname, "Dixie" was given to him in his youth. It is claimed that Dean and his family did not like the nickname. The most prominent theory of where the nickname came from was that in his youth he would drive his fist, also called digging, into the back of the girls when they played tag. This turned into Digsy and is believed to have later been distorted in Dixie. It is also believed that he had to do with the Southern United States and a popular song during his youth. Dean started his career with the Tranmere Rovers. While in Tranmere he was involved in an on field incident which caused him to lose a testicle. When a team mate rubbed the area to ease the pain, he shouted "Don't rub 'em, count 'em." Dean would later transfer to Everton It was with Everton that his most famous feat occurred, scoring 60 goals in a since season. That record still stands in all of English football. Dean would also play for the England national team. Dean passed away on March 1st, 1980. Prior to his passing from a heart attack, his health had been steadily deteriorating starting 1972. In 1976 he had a leg amputated due to a blood clot. Dean was imitated into Randle Holme Lodge No. 3261 on February 18th 1931.